In 2010, there were 3 American workers to support every retiree. By 2030, that ratio will shrink to 2 workers for every retiree.1 Here’s why this is critically important to the Ohio businesses we proudly support—there are fewer quality people available. For example, a central Ohio manufacturer recently shared with us that they were short 80 people…per shift! This issue will only become a stronger challenge in the future. In light of this, the need for a responsive, creative, knowledgeable automation solutions provider is critically important. Along with staffing concerns, today’s competitive environment has companies working harder every day to increase profitability while using fewer resources, often by finding ways to reduce spending. While that is one way to develop leaner operations, Voelker Controls has chosen a different approach. We believe this brings a greater return. For over 40 years, we have worked to understand our customers’ world and their obstacles to profitability: labor turnover/shortages, downtime, end customers’ quality standards, 100% track & traceability and cash flow, to name a few. Our specialists in Cincinnati, Columbus and Dayton work with you to learn your processes, research areas of concern and craft cost-effective, robust automation solutions. Our goal is to serve as co-investigators: asking questions, reviewing process flow and analyzing component performance. 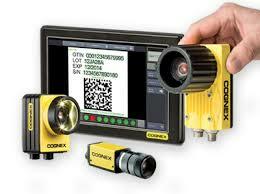 These steps isolate and identify the most effective means to improve throughput with safety and efficiency. As well as the input of responsive account managers, our team includes full-time Application Engineers. 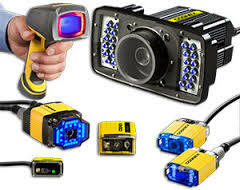 They serve as your technical experts in their respective fields with decades of experience in the mechanical, pneumatic, robotic and machine vision worlds. Our goal is provide an experience for our customers that goes far beyond ordering from a website or a massive paper catalog. We want you to have strong peace of mind, so that your choice to partner with us will be the best way to optimize your processes. Once a solution is in place, we back it up with highly-responsive, personable customer service and knowledgeable technical support. We are with you every step of the way! Our specialists research your production environment to see how we can optimize your company’s profitability in these basic categories. So let’s look more closely at each one. We provide the support of a mechanical engineering design team that can take a simple napkin drawing and provide an initial proof of concept. Our average turn time for this free service is 2-3 days. In addition, our 80/20 solutions include kitting options that deliver the exact components needed for your approved design. 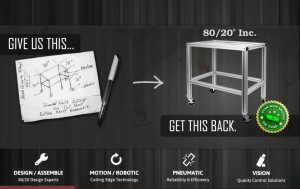 Business partners with the manpower and time to assemble their 80/20 creation are then able to save on their budget and time demands. For those who have greater need of support, Voelker Controls provides full assembly and delivery. 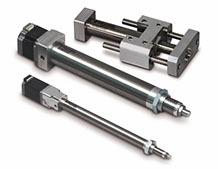 So let us take the hassle and guesswork out of your 80/20 project with a well-designed, rugged assembly that lasts! We have found that one of the greatest energy uses in your production efforts is compressed air. 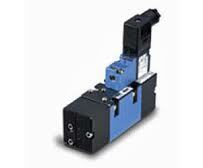 When pneumatic valves and supporting components fail or work inefficiently, the costs are not only financial. Throughput challenges, downtime losses and high maintenance labor efforts all have significant impacts to your bottom line. Our customers have suffered expensive downtime and loss of production due to just one dramatic air loss that took costly time to track down. For these critical reasons, we proudly provide and support Mac Valves, a proven industrial partner for decades. Every component on the valve is 100% inspected for quality, further adding value to their industry-leading design & durability. Because of their commitment to quality, the typical lifespan of a Mac Valve is 3-10 times that of traditional valves. Voelker Controls provides on-site evaluations of businesses’ pneumatic processes to help identify air waste and components to replace. We retain knowledgeable, pneumatic technical advisors that can provide prompt, precise feedback to optimize your compressed air usage. Our team can generate a report for you that summarizes cost savings and ROI for proposed upgrades. 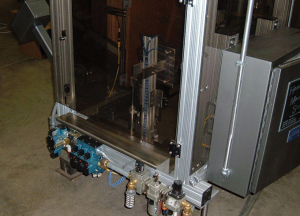 As an added value, our industrial supply staff in Franklin, OH ensures that individual items or pre-assembled pneumatic configurations arrive at your door in a timely manner. Our inventory in Franklin, OH includes often-used pneumatic valves and accessories to keep your production efforts running smoothly. Your compressed air costs can be effectively managed, and we look forward to working together to save your company money while boosting safe, efficient throughput. 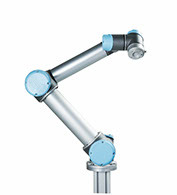 We partner with industry leaders like PHD for robust motion tools and Universal Robot for excellent robotic solutions. 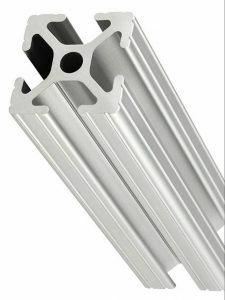 Our motion components have been chosen for their reputation of durability and responsive customer service. The robotics providers we partner with utilize cutting-edge technology to address staffing challenges and repetitive-motion concerns. Most importantly, on-site demonstrations provide you the convenience of working within your team’s busy schedules to show how we have optimized production processes. Voelker Controls partners with industry-leading products that have a proven track record of engineering support and responsive delivery. More importantly, we work constantly to attract & retain customer-driven, personable team members and highly-skilled application engineers. 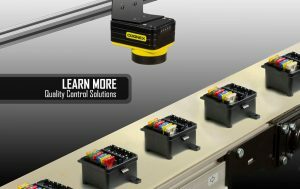 To meet your time-sensitive needs, we inventory a wide selection of automation components. For these reasons, our greatest strength lies in our multiple levels of support. We ensure that you have a number of avenues to access our highly-responsive team members for your automation needs. Our most unique value to our customers comes through our free, hands-on training. At our headquarters in Franklin, OH, we regularly provide complimentary workshops for robotics, machine vision and barcode/ID reading. For customers who are not able to travel, we come to you! All four of our core proficiencies can be brought to your door so that your team can learn firsthand at your facility. When you partner with Voelker Controls, the learning never stops! We constantly work to keep up-to-date with your processes and provide opportunities for your team to grow in their automation skills. 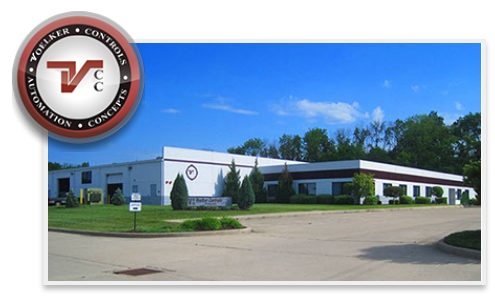 Contact us today at 937-433-8128 or at www.voelker-controls.com to schedule a visit from one of our specialists in the Cincinnati, Columbus and Dayton areas. When your team experiences the Voelker Controls Advantage firsthand, you’ll wish you had called us sooner!